Capturing the elegance of a bygone era, this Devonshire drop-in bath is reminiscent of old-world design. High-quality acrylic construction ensures durability and luster, and a palette of KOHLER colors is available to complement any decor. 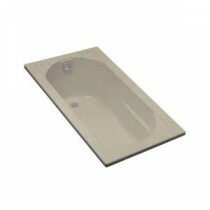 This bath is suitable for installation with a left- or right-hand drain.